In breakout session BD12: Hyper-V and Dynamic Memory in Depth, a demo environment was presented with a dozen virtual machines allegedly configured to use Dynamic Memory, with the Hyper-V Manager interface boldly displaying “Dynamic Memory” as part of each VM name. Hyper-V Dynamic Memory requires cooperation with guest integration services. Without those services, VMs will fall back to good, old-fashioned Static Memory. It’s easy to see that Dynamic Memory is actually enabled and working here, as the assigned memory for each VM has increased based on the demands of a running operating system. 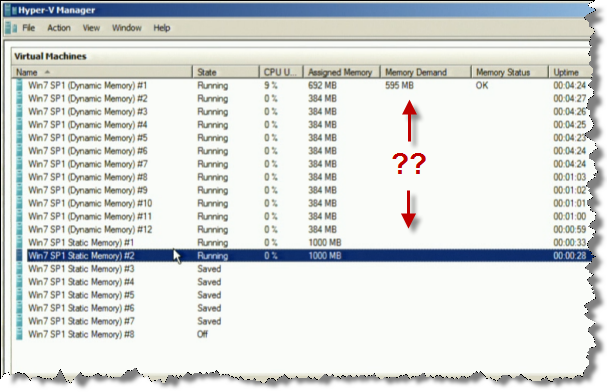 Clearly the Dynamic Memory demo at MMS 2011 was misleading, but why? Could Hyper-V Dynamic Memory have accommodated that same VM density if operating systems were actually running? They cannot trust their own product not even for a demo for a very friendly audience !!!!!! Shame, shame , shame, MS should at a minimum fire the people organizing this lab. And yeah, Hyper-V (with SP1) ran all the HOL for the event. I attended and used the labs – they worked great. The same number of VM’s were provisioned this year as last (40k) using 9 fewer servers and 1TB less RAM. Those [expletive deleted] pretend dynamic memory works but that’s a big lie. Hyper-V is a [expletive deleted] product designed by stupid engineers. Although I do agree it’s silly to demonstrate Dynamic Memory with only one host supporting it there may be many reasons why they couldn’t demonstrate it with all the machines on Dynamic Memory. Especially since the product is still in beta some glitch made have turned up which made the presenter decide to not boot the OS on the other VMs. You might want to double-check the release status — it’s not still in beta. Sorry, meant the System Center Virtual Machine Manager beta link not the full System Center 2012 Beta 2. What a crap article. Typical for VMware people. The demo used real guest OS’ses, not empty VM’s. So what? If it makes you feel better, set the start-up higher. In my lab we setup several VDI scenario’s and as expected nearly every VM ended up using more than 384MB. The point is, set the startup values as low as possible – give the OS the minimum it needs for an acceptable end-user experience at initial login and increase the RAM in the VM as needed. I love how you make this sound like this is some kind of a problem – it’s doing exactly what it’s supposed to do. The added benefit here of course is that once all the phyiscal memory is consumed the lower priority VM’s performance is affected BUT at least the VM is handling the paging and not relegating that to the hypervisor which impacts perfornance of ALL the VM’s on that host. Speaking of FUD — excellent recital of Microsoft’s misleading line about hypervisor swapping and how only their approach works in conjunction with the guest OS. News flash: This is memory ballooning, a technology invented by VMware a decade ago, and the primary means of memory management on ESX. Hypervisor swapping is a safety valve to prevent hosts from suddenly starving when guests don’t cooperate. Of course balloning works in conjunction with the VM OS. The fundamental difference is that if ballooning can’t reclaim enough memory, hypervisor swapping will kick in and this of course impacts the performance of ALL the VM’s running on the affected host. This doesn’t occur…ever…with dynamic memory. VM priority allows the administrator to control which VM’s will always get memory and only lower priority VM’s will potentially suffer performance issues. Why would hypervisor swapping impact performance of ALL VMs on a host? vSphere has priorities as well as reservations and limits to guarantee performance. The statement you made is incorrect. yeah, reservations work well for THAT VM. Once it grabs all the memory reserved, there’s no way for ESX to give it back…even if the VM isn’t using it anymore. This could accelerate compression or overcommit for other VM’s with no reservations…even though there’s potentially plenty of memory available because VM’s with reservations are sitting on idle/unused RAM that can’t be re-allocated. We can go on and on, Eric. My point was that your post here is very misleading, particularly since you seem to provide a pretty nice demo of how well DM is working in your own lab environment. Okay, if reservations are not suitable then use shares to specify priority. Sounds like you were not even aware of the resource management capabilities in vSphere or you would not have made these claims about how ALL VMs are affected on ESX and that dynamic memory doesn’t have this particular problem because of an innovative priority concept. Again, the statement you made is incorrect. My post is not misleading, but that live demonstration of dynamic memory was. hmmmm….use reservations, or limits or shares…or some combonation of 2 or more of those…but you have to know exactly what your use cases are to figure out which one(s) to use…or use DM and set a start-up and max value and you’re done. I attended the DM session at MMS and I didn’t think it was misleading at all. A good demo, certainly not. With vSphere you just set VM RAM and you’re done. Adjusting shares are optional — equivalent to the priority feature in Hyper-V. I did not say the session was misleading, just the demo. It’s clear that there are misunderstandings about VMware technology, thanks in no small part to Microsoft claims. Glad we could sort this one out. So I have seen when people make anti-VMware comments on this site you say something to them. Yet when Booba spurts her gutter vitriol….I hear crickets? IMHO Hyper V is catching up. Soon the pricing on VMware will drop. You raise a valid point. But, to be specific, I’m not discouraging anti-VMware comments — just personal attacks. My feeling is that the Hyper-V Manager screen isn’t updated correctly and therefor the Memory Demand value isn’t displayed correctly. Occasionaly I have seen this in my own lab as well. 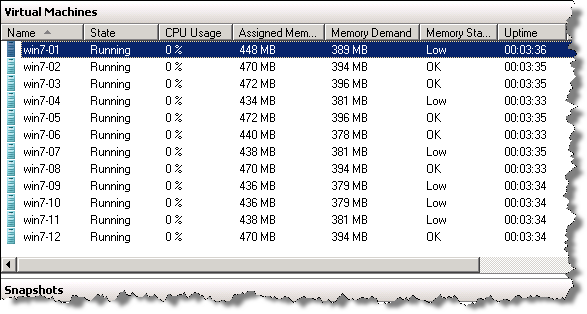 I agree with Ruben – my lab is running 4 VMs right now and mine don’t show anything for the memory demand column. I can say with all confidence that dynamic memory must be working because my crummy single CPU memory starved desktop lab is actually usable again and performs quite well again after I applied SP1. I’m happy to have my lab again! Thanks SP1. What a joke – Eric closes down a thread with an emphatic “there are misunderstandings about VMware technology, thanks in no small part to Microsoft claims”. I’ve never seen a company with such a dominant market position talk so much crap about a competitor with something like half of their share, maybe less. And then, on a public forum cry and whine about how their product is so misunderstood because of said competitor. You have got to be kidding me. Most of the stuff you publish here is straight up FUD, it’s your job. This post is nothing short of that. When all you have left is to nit-pick a crappy demo done at a Microsoft conference (as if we all don’t know, including yourself that it was just that – a crappy demo and not indicitive of the products capabilities), then it’s certainly a sad day for VMware. “Misunderstanding” was merely a euphemism. You came to the defense of Hyper-V ill-prepared, unaware of the advanced resource management capabilities vSphere administrators have enjoyed for years. The grim reality (euphamism for VMware not sure what do with Microsoft beating down their door…) is that both products are very good. But, VMware is all about features – you have to be. So, you release alpha code crap like Fault Tolerance and charge customers for it to show your innovating and setup blogs like these paying FTE’s to beat down competitors that are years late to the game but coming on strong in any attempt to maintain that foothold. Once again, the mere fact that your best material at this point is nit-picking a crappy MMS demo you saw on DM is all that needs to be said about how the game is changing. Clearly… VMware is.. SKEERD… and rightfully so.. this blog is clear evidence of the gap closing fast ..
MS is commoditizing virtualization (at least in the Windows world).. so ya.. VMware should create some more competitor bashing blogs.. They’ll need the FUD to stay afloat..
No sense bothering to reply.. I wont be back to this site … ever.. its complete and utter FUD. We can all discuss the merits of either technology between MS Hyper-V and VMWare and even Citrix, but what I am seeing today in the SMB space is Microsoft all the way. I do not even see VMWare except old installations (2.x or 3.x products). You take a Windows 2008 Server out of the box and enable Hyper-V role, and you have a VM platform. Microsoft made it too easy – this is the critical point. VMWare may be more mature, but do you really think MS is sitting still? In 3-5 years, Hyper-V installs will dwarf VMWare, thanks primarily to the SMB space. Oh, and lastly, the VSS snapshots of the VHD’s…no extra cost. VMWare and other vendors, extra. For DR purposes, you can have a flexible setup in terms of destination / file system / backup / restore options – all free with Hyper-V.
By the way, this is my first time to this site. It has good contents on VMWare, but it is seriously biased. If you discuss all the technologies is a non-biased terms, you would have more repeat readers. People are turned off my overly biased writings and opinions.